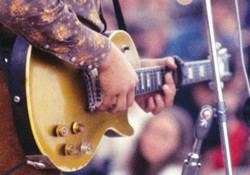 After more than five decades, the P-90 Gold Top is still one of the best guitars ever made. Gibson made the guitar with a tune-o-matic fixed bridge only from 1955 until early 57, so these particular guitars are extremely rare. But now is the time to buy one, as a couple of years ago, they sold for $75,000 to $80,000; the price is currently half as much in most cases.